Join up to 6 per month! Join as a Free Member! 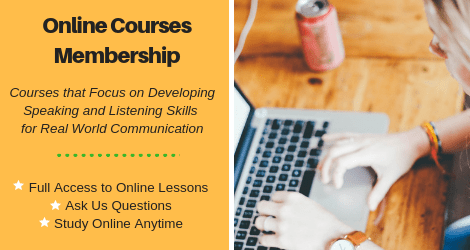 Join the Online Courses! 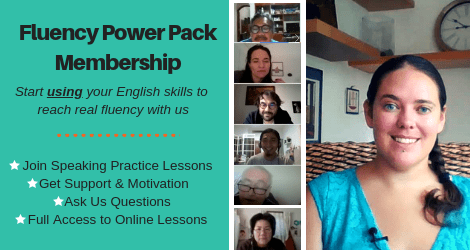 Join the Fluency Power Pack! Get access to full lessons from each of our courses to try! Perfect for students that want to talk to real people and practice speaking with a native speaker. PLUS you also get access to all the online lessons that allow you to practice your listening comprehension and speaking fluency. It’s easy to change your membership at anytime or upgrade. It’s easy to change your membership at anytime. 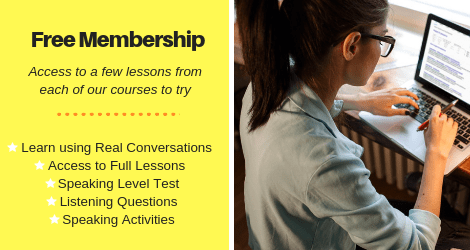 Perfect for students that want access to high-quality online lessons that allow you to practice your listening comprehension and speaking fluency. It’s easy to change your membership at anytime or upgrade your membership. Get the specific help you need in a one-to-one lessons with a native speaker! Using the methods and lessons from our courses, we can help you to rapidly improve your speaking and listening skills. Take Private Lessons with Us! Are Our Lessons Right for You? Take our this short test to determine your level and the recommended membership!